This gorgeous and extremely lifelike yellow-crested cockatoo by Timofey Tkachev shows off some expert sculpting techniques. 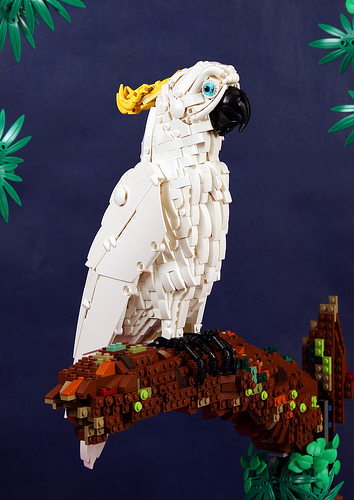 Building a feathered friend from LEGO bricks isn’t easy, especially when you want to capture the variety of textures in its plumage. Timofey has opted for a clever counterpoint between a patchwork of angled slopes for the breast and smooth Technic panels for the wings. In addition, little highlights have been added through the use of specialist elements: a croissant, banana, dinosaur tail and others pieces are all hidden away in the model, each adding to its crisp detailed finish.